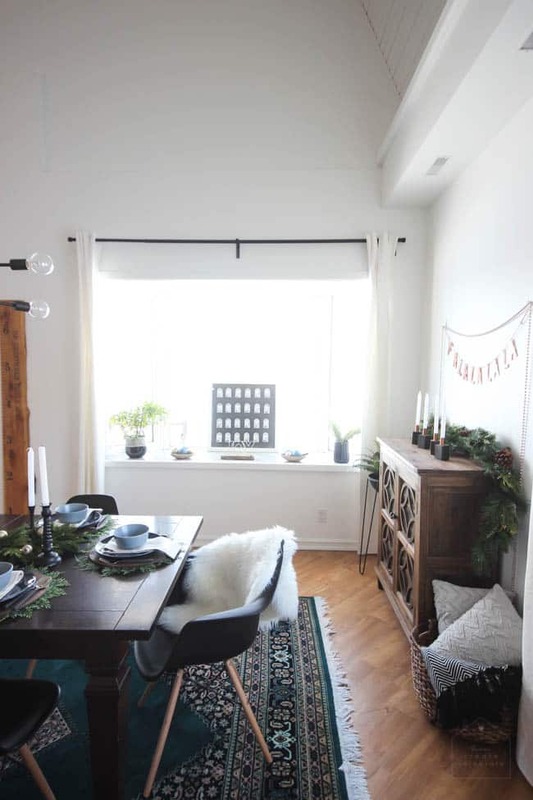 Home tours might just be some of my favourite blog posts I ever read. I love seeing how people decorate their homes. And since I’ve started blogging, home tours have become some of my favourite posts to photograph and write too! Since we moved into our new Barn Home, this is the first peek at our dining room,and it’s all decked out for the holidays. 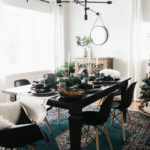 I’m sharing my dining room as part of the Christmas Tour of Homes. I’ve partnered with 25 great bloggers who are sharing home every day! So be sure to stop back each day to check out more of the homes (all the links are at the bottom of the post!). We don’t have all of the furniture for our new dining room right now, so for now it feels a bit sparse sometimes, but truthfully I’m loving the openness of the space! 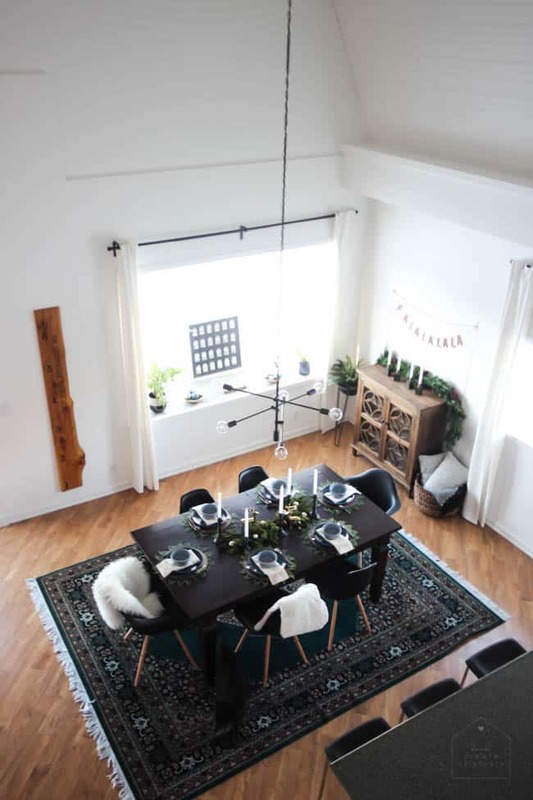 The beautiful rug was given to us and is perfect for the space! It’s the foundation of all of the holiday decor too. 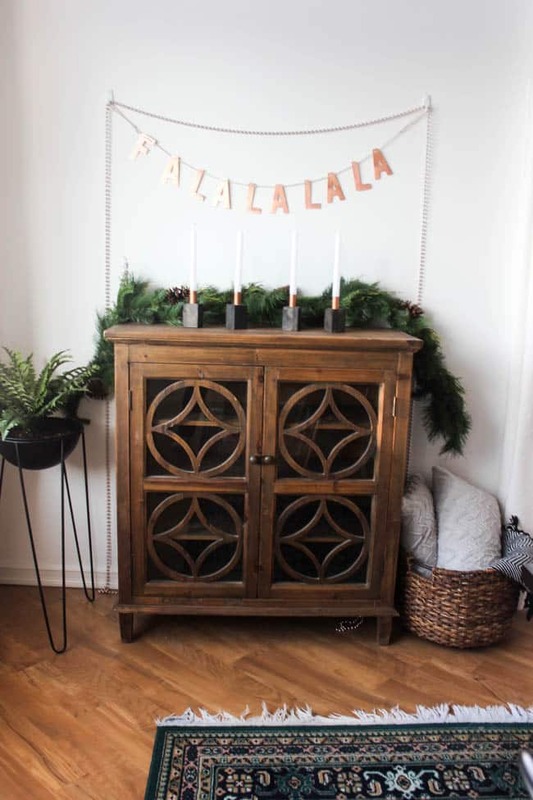 The only other furniture in the space right now is a small sideboard, which I decorated with a little bit of greenery and my new DIY candles. 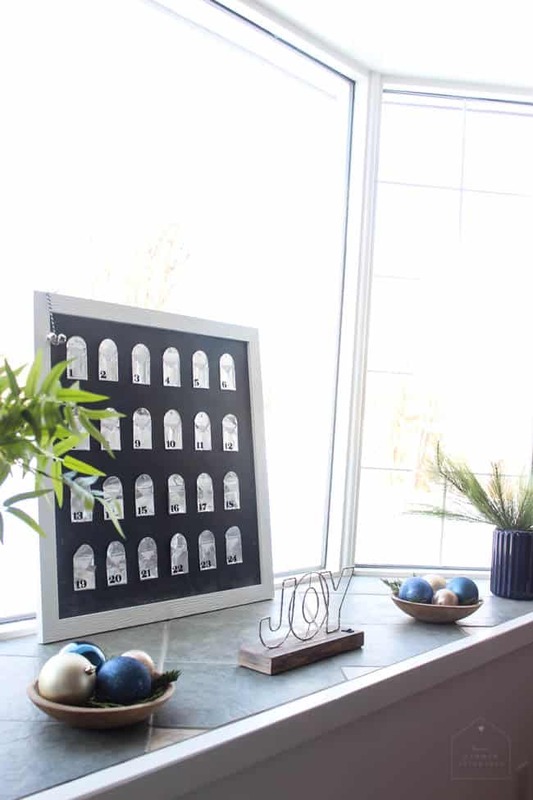 Then behind the sideboard is our bay window, which I just wanted to put a few simple decorations into, including our new DIY advent calendar. 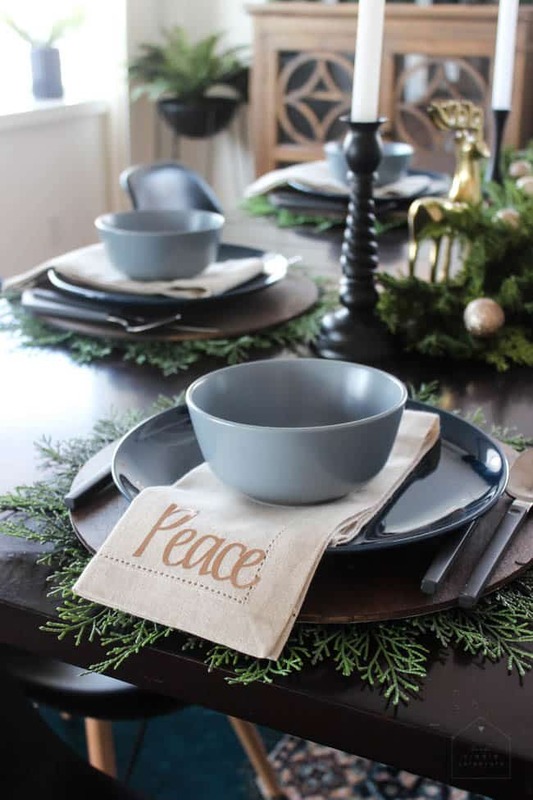 Then comes the simple tablescape. I took a lot of the same colours from my living room decor (coming soon to a blog near you!). The centerpiece was made of some greenery stems that I tied together. 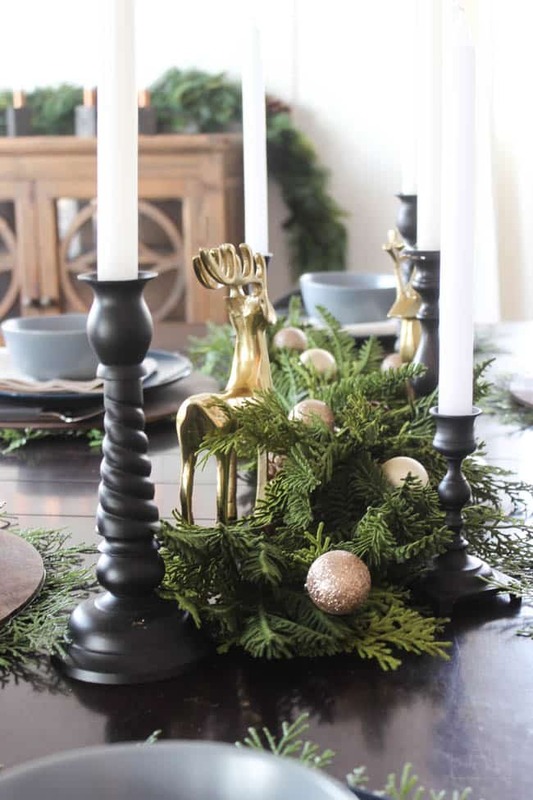 I added a few matte black candlesticks and a few some small ornaments to up the Christmas cheer. The place settings used my favourite blue plates and blue bowls. I’m always a fan of simple, yet elegant. You know I had to DIY a few things here right? 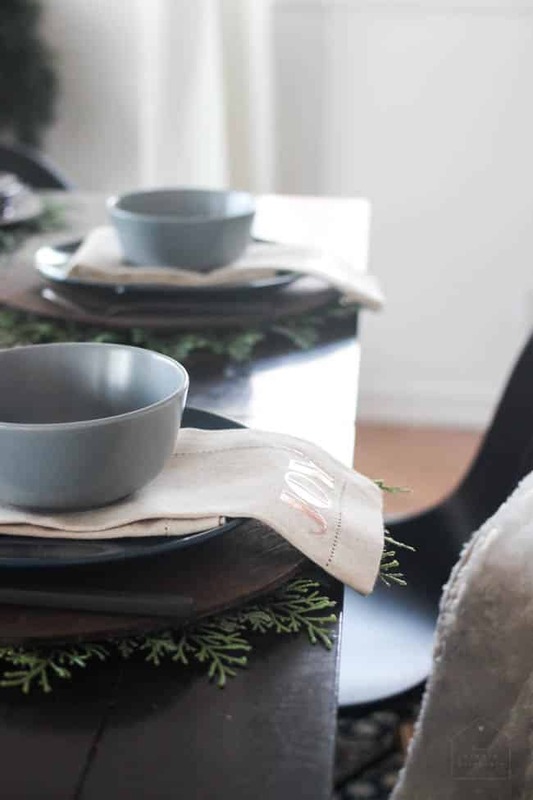 Well the Wooden chargers were made last year, and the DIY napkins will be shared tomorrow (stay tuned!). 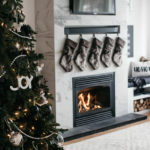 By the way, I’m sharing my Holiday Living room this week too! Come back Wednesday for some Christmas inspiration! Don’t forget to check out the other homes tours being shared all week long! 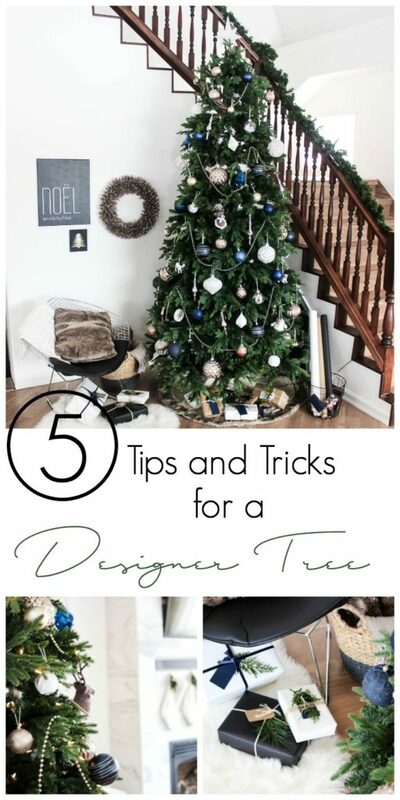 5 Tips for Your Own Designer Tree! 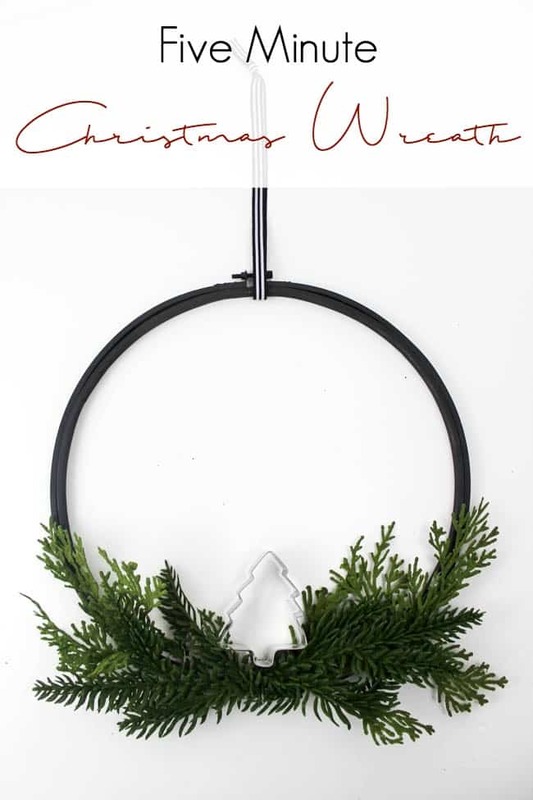 If you love DIY, you’ll love this Five Minute Christmas Wreath too! I’m happy to be on this tour with you. Merry Christmas! Lindi! This looks amazing! I love those napkins and that Advent calendar is the cutest. What a beautiful home you have – happy holidays! OH, MY! I JUST LOVE YOUR SPACE! THAT RUG FLOORED ME! PUN NOT NECESSARILY INTENDED! SERIOULSY, IT’S THE PERFECT TOUCH THAT SETS YOUR ROOM APART! 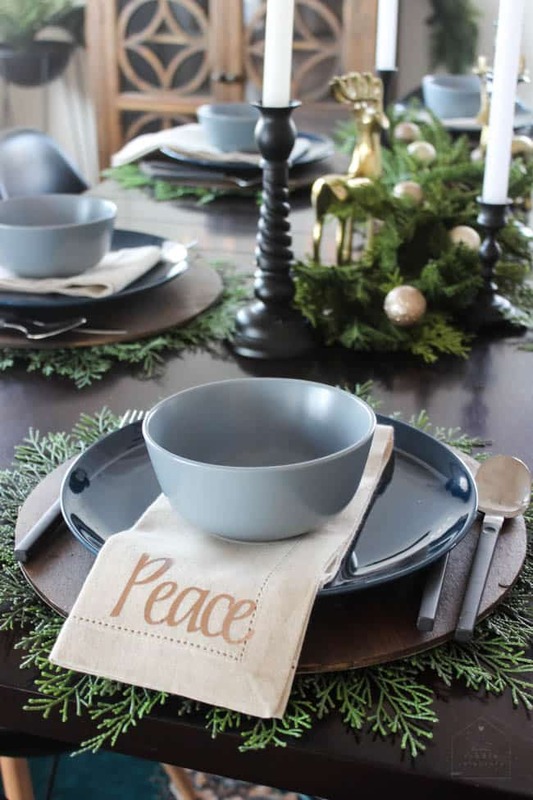 YOUR SIMPLE TABLESCAPE IS JUST THE RIGHT MIX OF SIMPLE FESTIVE TOUCHES FOR YOUR SPACE. Beautiful. 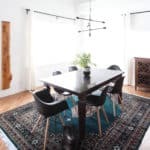 I love your dining room sparse as you stated in the post! its the way i love to decorate minimalistic! 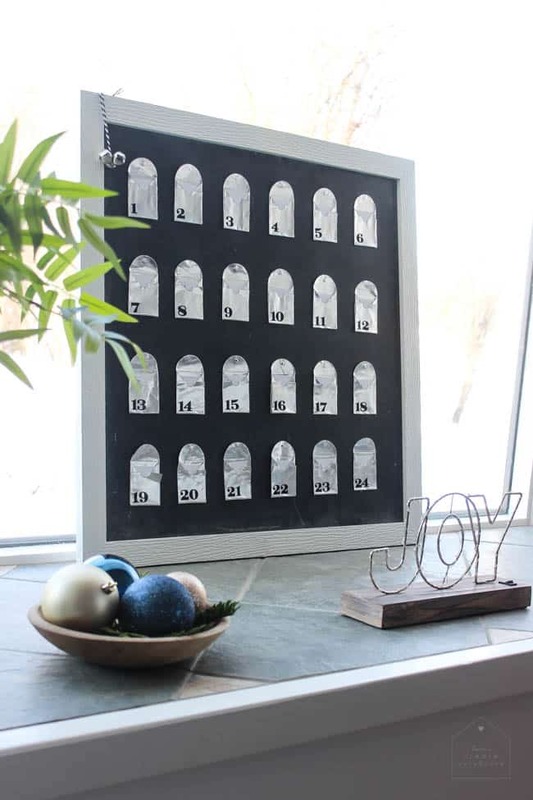 That advent calendar so pretty. 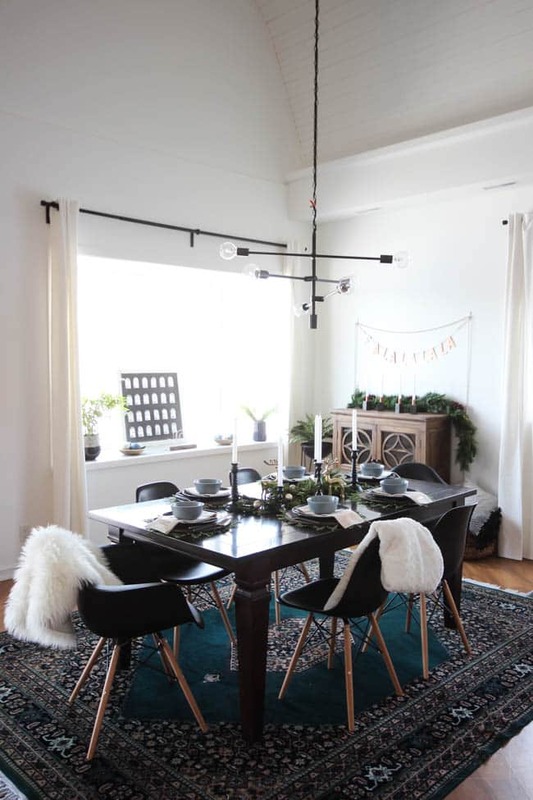 Your dining room looks lovely Lindi! I absolutely love the way you added greenery around your chargers, I have to do this in the future! So pretty. Thanks so much for joining us this year for the Christmas Tour of homes! 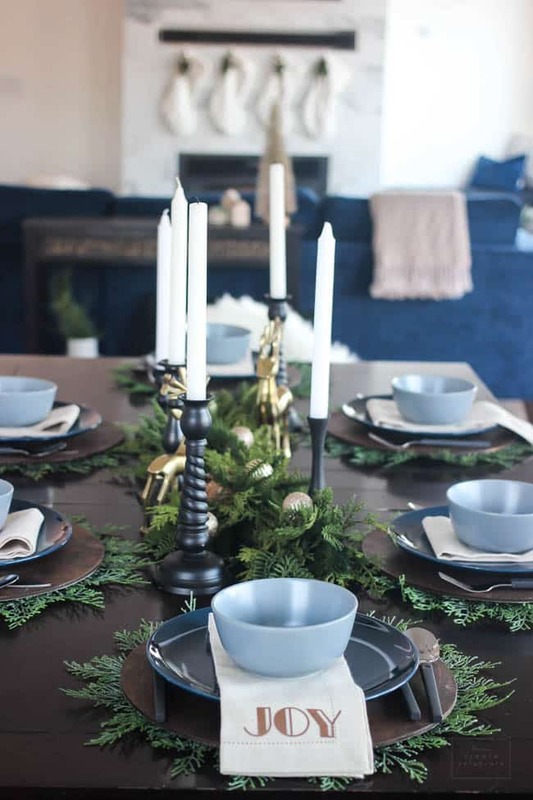 Love all the blue and your table is stunning. So glad to be on the tour with you. Merry Christmas. Now I have to go back and check out the wreath! Pinned and grinned! 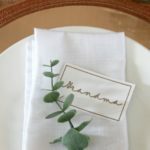 Thank you for sharing your beautiful home as part of this blog hop! I bet you were excited to decorate your new space after finishing the ORC. Just in time for the holidays!! Everything looks beautiful! Happy holidays! 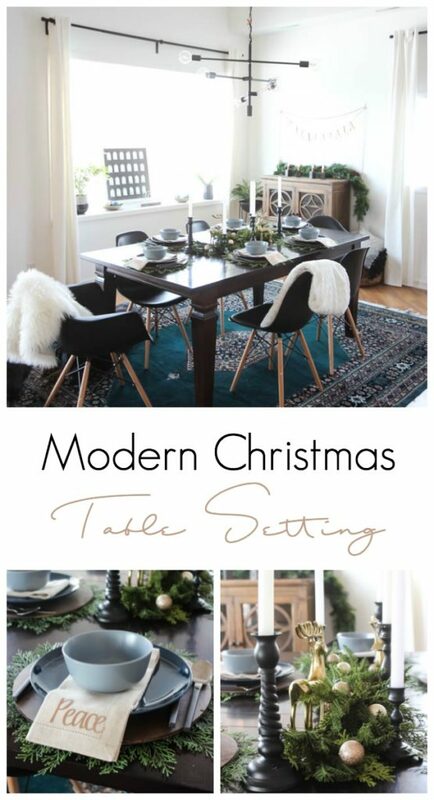 Your dining room is so pretty and I love the way you have decorated it for Christmas. The table looks beautiful with the gold dear and the greenery. Thank you so much for joining us in our Christmas Tour of Homes. 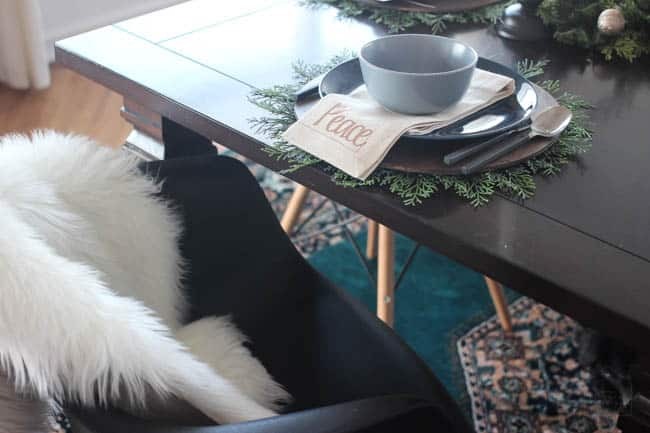 Oh Lindy, your dining room is just lovely and the transformation of that open downstairs area is remarkable…I know you are so excited to have your first Christmas in your new home. 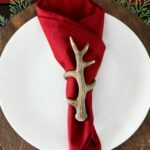 I’m looking forward to seeing your tutorial on those napkins! How charming! Thanks for joining us on our Christmas Tour of Homes. We are so glad to have you. 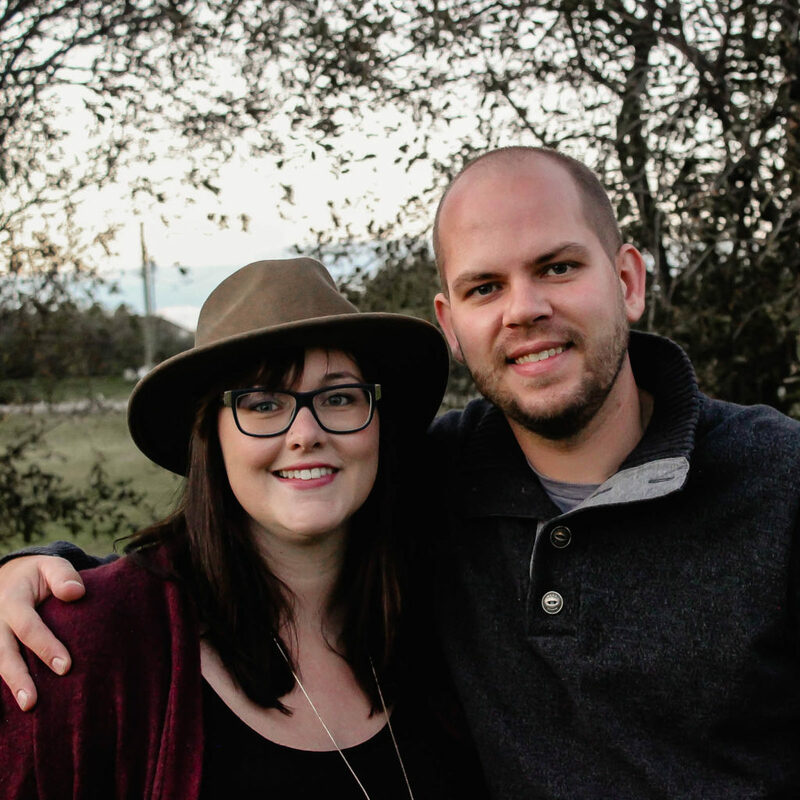 I completely agree with you, Lindi, home tours are my favorite! Your dining room is looking gorgeous! I love all the color with your white walls. 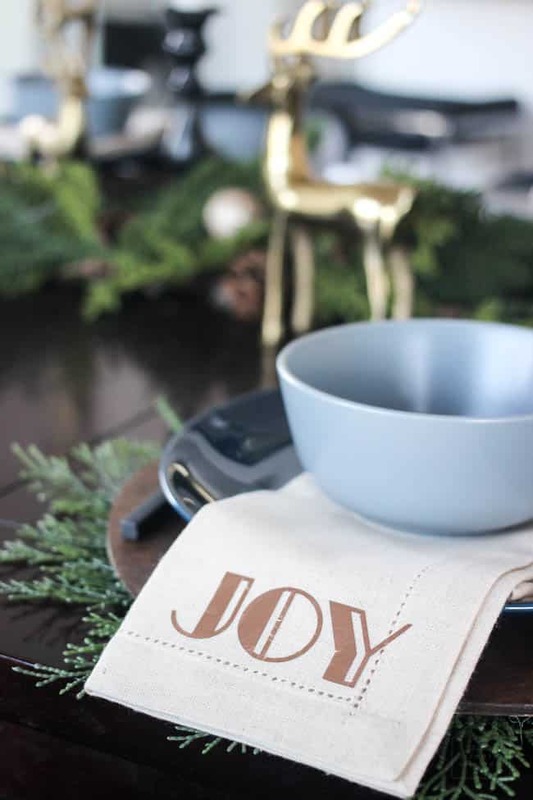 Looking forward to seeing how you made your napkins because they are too cute. Happy Holidays! Everything looks beautiful! 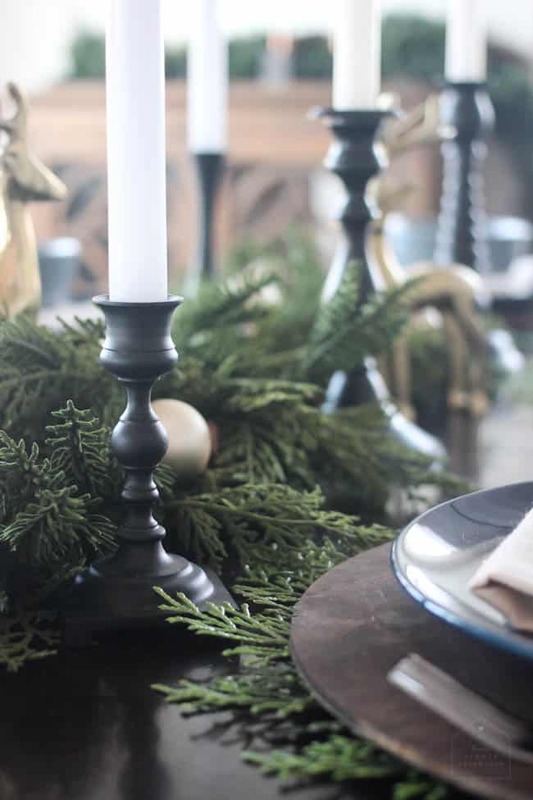 I love the candlesticks on the buffet and the tablescape. Thanks for being a part of the blog hop! Love your blog! 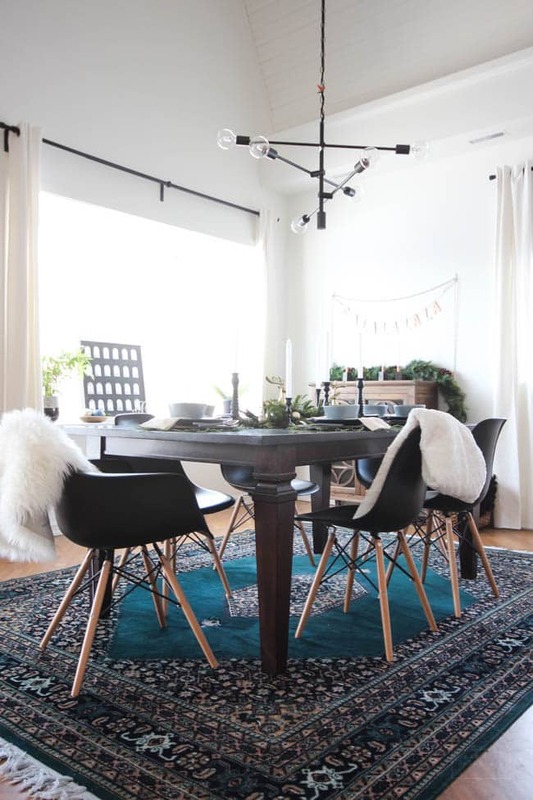 Lindi, I love the brightness of your dining room and how the beautiful blue rug grounds the entire space. 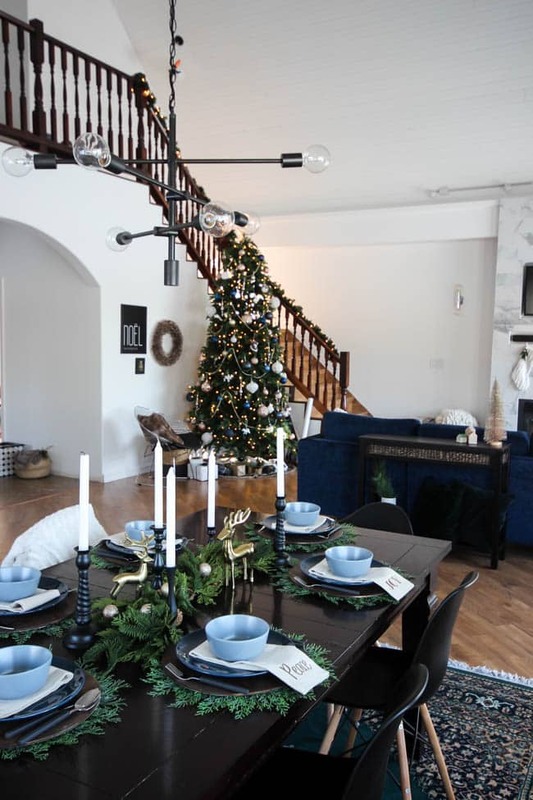 The deep blues pair perfectly with the bright brass reindeer. I think we had dinner together as part of Kirsten’s group at Haven? Glad to be on this blog hop with you. Home tours are my favorite too and love curling up on the couch and browse people’s homes! So fun to see your new home, Lindi! Your dining room is beautiful! Love yours staircase too! 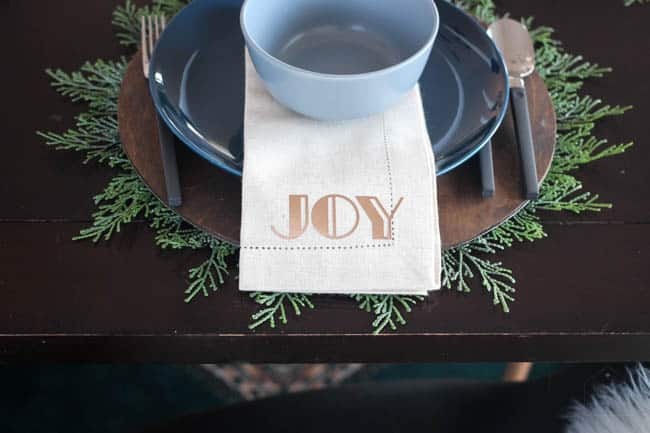 Enjoy your first Christmas in your new place! Wonderful DIYs! The candles, chargers, and napkins are perfect! Did you buy the greenery under your chargers or make it? I loved the tour and your dinning room. Good Morning! 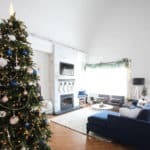 I am loving this Christmas Tour and your home is fabulous! 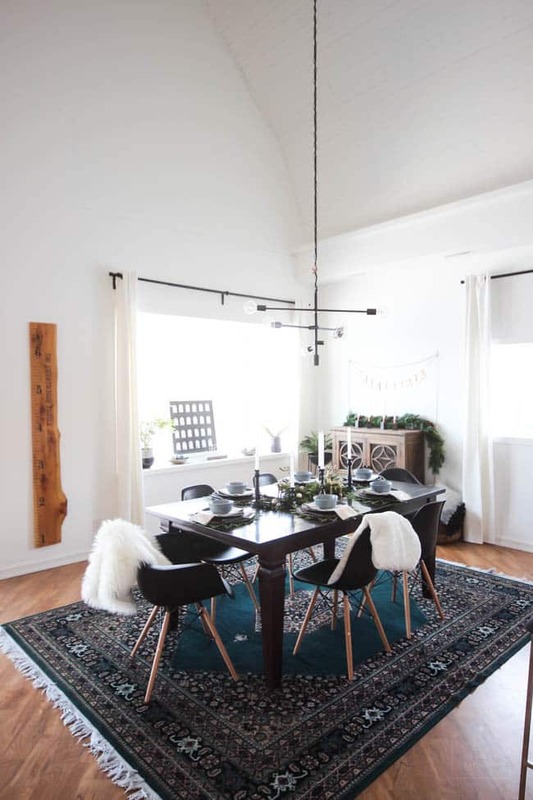 Love the light and bright feel of your home and all of the gorgeous details of your dining room. Gorgeous! Lindi, I love what you’ve done with your barn home in the short time you’ve had it, and the way you’ve decorated it for Christmas. The rug you were given is really beautiful! I love your candle holders you made, as well as the advent calendar and the greenery. It was great having you join our Christmas Tour of Homes! Your dining room is lovely. 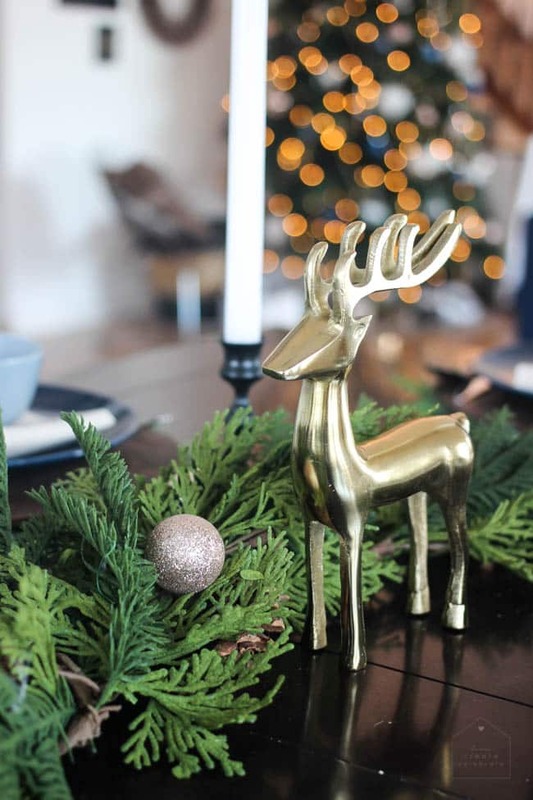 I love the gold deer and the greenery on your table, and those chairs looks so comfortable! Lindi your new dining room looks amazing. 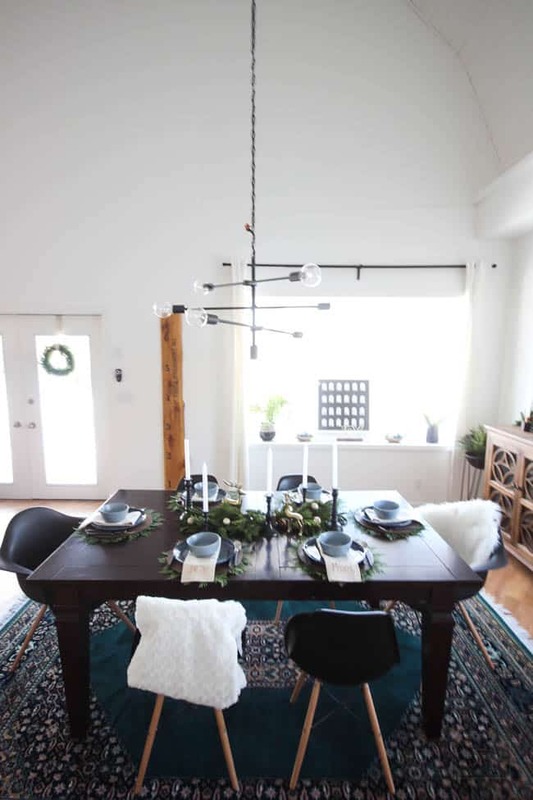 Love the minimalist vibe -and the pretty Christmas touches.